The South Dakota 4-H Air Pistol team placed third nationally. This team placed in the top four in each phase of the competition. Team members pictured include: (left to right) coach, Arthur Kneen, Sanborn County; Wade McClanahan, Tripp County; Cassandra Ryckman, Hughes County; Katrina Fatherlos, Union County, and Carter Trefz, Faulk County. BROOKINGS -The 2017 4-H Shooting Sports National Championships were held in Grand Island, Neb., June 25-30. Twenty-seven South Dakota 4-H members were among the more than 700 to compete in the national event, which attracted youth from across the country. South Dakota youth competed in the Shotgun, 22 Pistol, 22 Rifle, Air Pistol, Air Rifle, Compound Archery, and Recurve Archery. Those youth qualified through their placings at the Spring Shoot in Pierre and the Fall Shoot in Mitchell. The South Dakota 4-H Air Pistol team placed third nationally. This team placed in the top four in each phase of the competition. Team members include: Wade McClanahan, Tripp County; Cassandra Ryckman, Hughes County; Katrina Fatherlos, Union County and Carter Trefz, Faulk County. Arthur Kneen of Sanborn County coached the team. For more information on the national teams, check iGrow.org. For additional information about 4-H Shooting Sports, contact John Keimig, SDSU Extension 4-H Associate, at the State 4-H office, 605-688-4167. Youth who attended the cooperative education trip to Minneapolis include, standing, left to right: Megan Hanson of Britton, Karly Schaunaman of Aberdeen, Abby Dethlefsen of Stickney, Brenna Johnson of Groton, Haley Keizer of Plankinton, Jennifer Hanson of Britton, Caleb Nugteren of Canistota, Hannah Sumption of Frederick, Bree Weidenbach of Canistota, Jim Brockel of Shadehill, Nick Snedeker of Woonsocket, Skylar Cox of Frederick, Justin Goetz of Herreid, Dalton Gerlach of Stickney, Joseph Nugteren of Canistota; seated, left to right: Marissa Holinka of Watertown, Cassidy Keller of Canistota, and Katherine Oberembt of Ethan. One such cooperative was a housing initiative started by students at the University of Minnesota. The trip also included stops at an organic food cooperative, CHS Inc., and REI consumer cooperative, where students had the opportunity to ask questions, get professional and internship advice, and see each in action. …Read more of the article in this week’s issue of the Sanborn Weekly Journal. 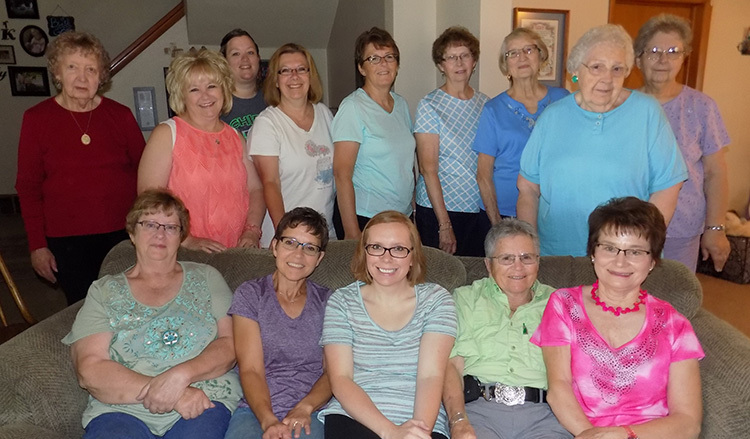 Ladies of the Prairie Lutheran Parish, which consists of Carthage Trinity Lutheran, rural Immanuel Lutheran of Iroquois, and Artesian First Lutheran, gathered for “Muffin Mornings” on July 8. 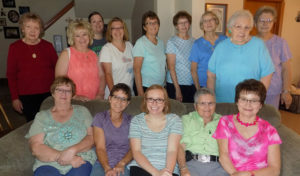 Pictured are: standing, Shirley Stroud, Gayle Larson, Jodi Burma, June Page, Jan Grassel, Jean Wormstadt, Donna Stroud, Lorelee Nelson and Harriet Hattervig; seated, Joyce Burma, Donna Koziolek, Marti Knudsen, Voni Durant and Judy Wormstadt. Marti Knudsen, wife of Pastor Josh Knudsen, has been hosting “Muffin Mornings” at the parsonage in Carthage every Saturday morning from 9-10:30 a.m. since June 17, and they will continue until July 29. It is a casual and informal time to gather, have fellowship, connect and discover how to nurture the fruits of the Spirit. All gals are welcome to attend.